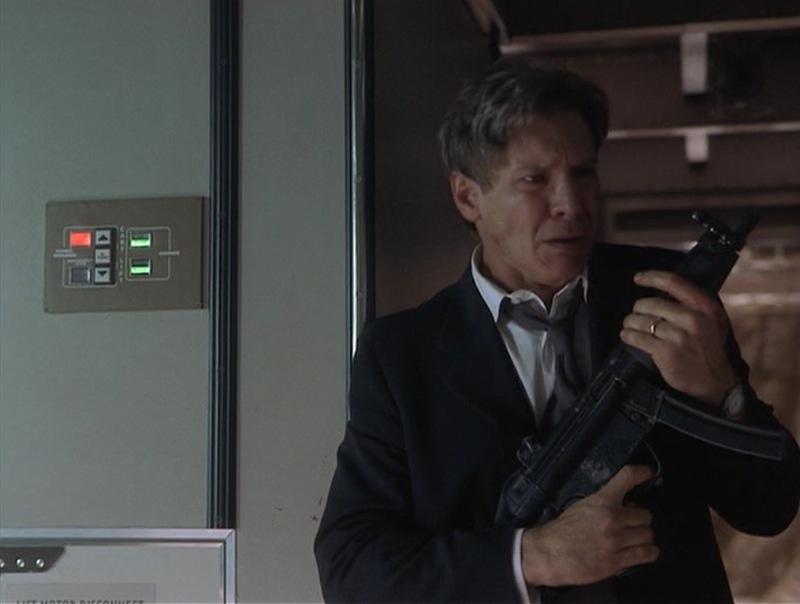 As we in the United States celebrate President’s Day this week, BAMF Style also celebrates Air Force One, where Harrison Ford played the most badass U.S. President since Teddy Roosevelt. 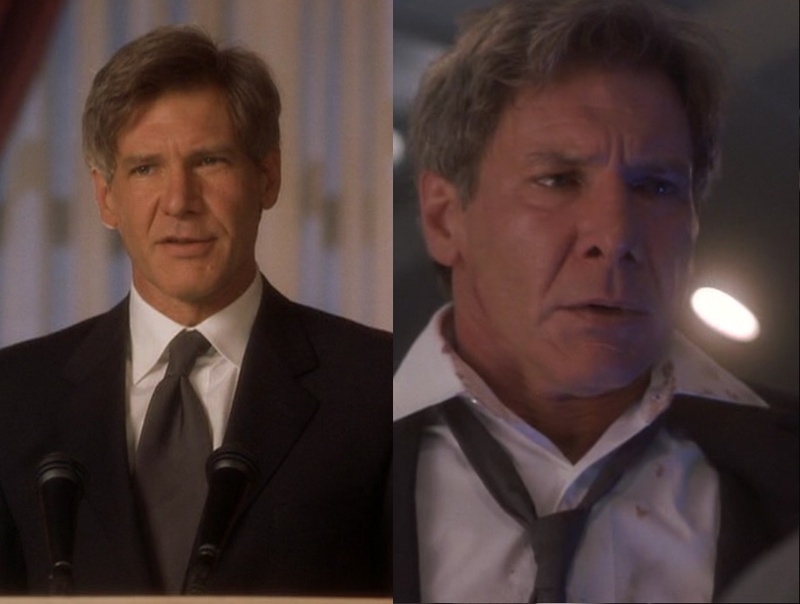 Harrison Ford as U.S. President James Marshall in Air Force One (1997). 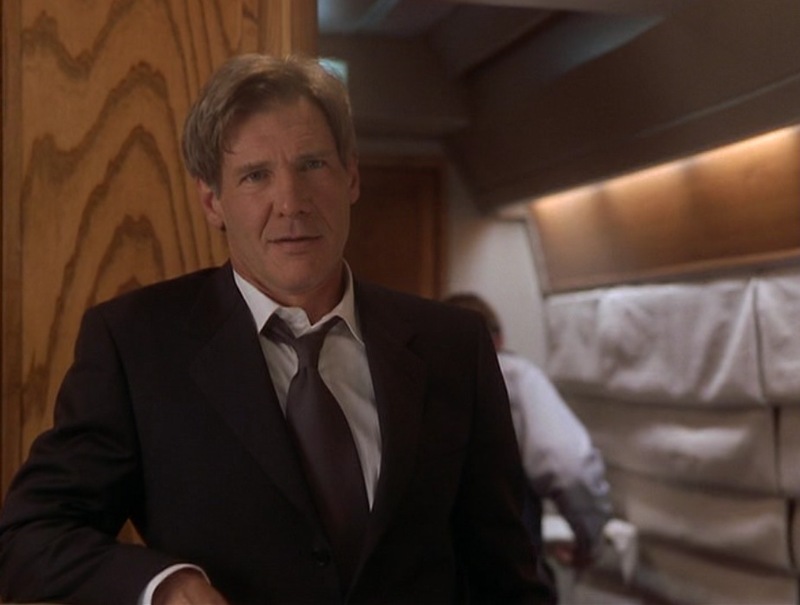 No matter what your politics are, every American can agree on one thing: Harrison Ford was a badass President in Air Force One. Never again will I allow our political self-interest to deter us from doing what we know to be morally right. Atrocity and terror are not political weapons. And to those who would use them, your day is over. We will never negotiate. We will no longer tolerate and we will no longer be afraid. It’s your turn to be afraid. Now, you could say that – although eloquent – it reeks of the typical grandiose, unfulfilled promises of political speeches. Then you see the president BREAKING A TERRORIST’S NECK WITH HIS BARE HANDS and you realize he means business. For his speech and subsequent action-packed plane ride home, the President chose a strong and somber black suit, white shirt, and solid gray tie. As he was in Russia, his outfit stood out for being very colorful. As a whole, the suit is a timeless look but the details help define it as a 1990s-style suit. The jacket is ventless with a typical single-breasted 3-button front and notch lapels. Additional details include 3-button cuffs, a welted breast pocket, and flapped straight hip pockets. The suit trousers have single forward pleats and cuffed bottoms. The pockets are standard: one on each side and two jetted rear pockets that fasten with a single button. The side pockets have a white lining seen in some of the action scenes. 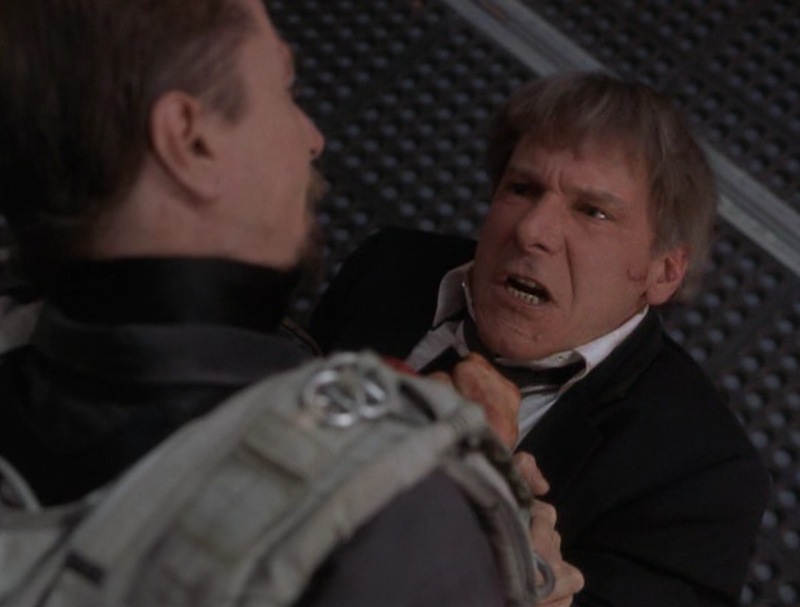 A black leather belt with a silver rectangular buckle keeps the president from embarrassing himself as Gary Oldman clings to his pant legs on the plane’s parachute ramp. Marshall’s white dress shirt buttons up a front placket to a set of moderate spread collars. A squared patch breast pocket, which Don Draper would use for cigarettes, remains empty. The President wears a set of silver “knotted” cuff links that outlive most of the film’s major characters. 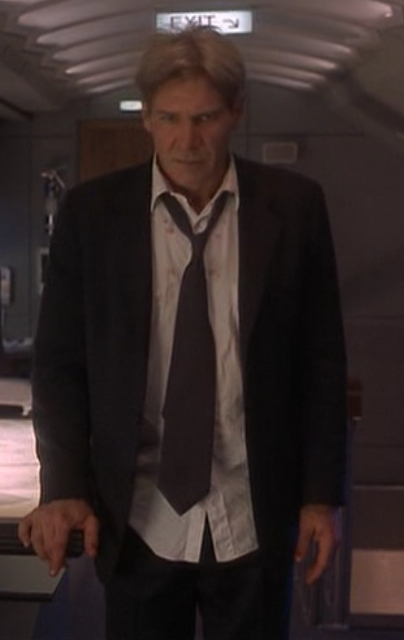 A dark gray necktie, wide and surprisingly poorly-tied, completes his look. A white label on the back of the tie may divulge the name of its maker, but that is out of my current capabilities. Not that it looks much better when completely untied, but there is something a bit wonky going on with the tie knot, right? 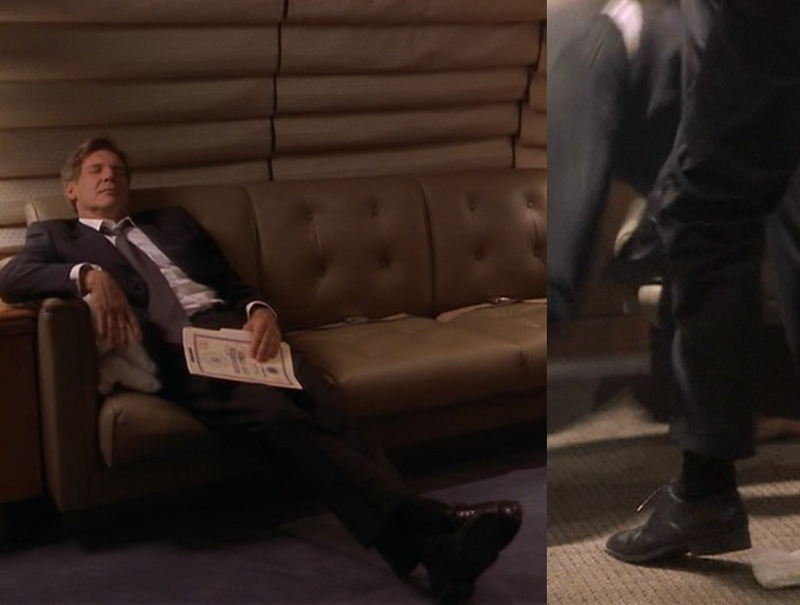 On his feet, Marshall wears a pair of black leather plain-toe oxfords and high black dress socks. Luckily for him, they’re tied firmly enough to stay on as his legs dangle 35,000 feet above the ground. The president won’t stand for any acts of terrorism. Not one for over-accessorizing, the president wears only his gold wedding band and a stainless wristwatch. The watch has a stainless bracelet, round silver case, and a white face. It is possibly an IWC Automatic. President Marshall reacts with horror upon learning that the White House has adopted Chumbawamba as a ringback. He wears no visible outerwear and no undershirt, despite Russia’s fairly earned reputation as one of the colder counties. Despite being one of the most powerful men in the world, Harrison Ford plays his president as more of an American everyman; he drinks Budweiser bottles – albeit out of champagne flutes – and he puts family and football above anything else, just like some say that a real man should. The president puts in some time with the wife before deciding Gary Oldman needs a good thrashing. However, you may find it useful to be a little better versed in cell phone technology than our poor leader. Marshall’s suit is just the right look for both a stirring speech in front of the world and throwing Russian nationalists off of a jumbo jet. While a situation like this doesn’t lend itself to firearm-friendly activities, you never know when you might need to get your hands on something. Since the terrorists were at at advantage thanks to duplicitous Agent Gibbs – who deserved a far worse fate than the scenic one he received – Marshall was left scrambling to defend himself with whatever he could get. In this case, it was a chopped and converted Heckler & Koch HK94A3 carbine made to resemble a Heckler & Koch MP5A3. Top: A genuine Heckler & Koch MP5A3. 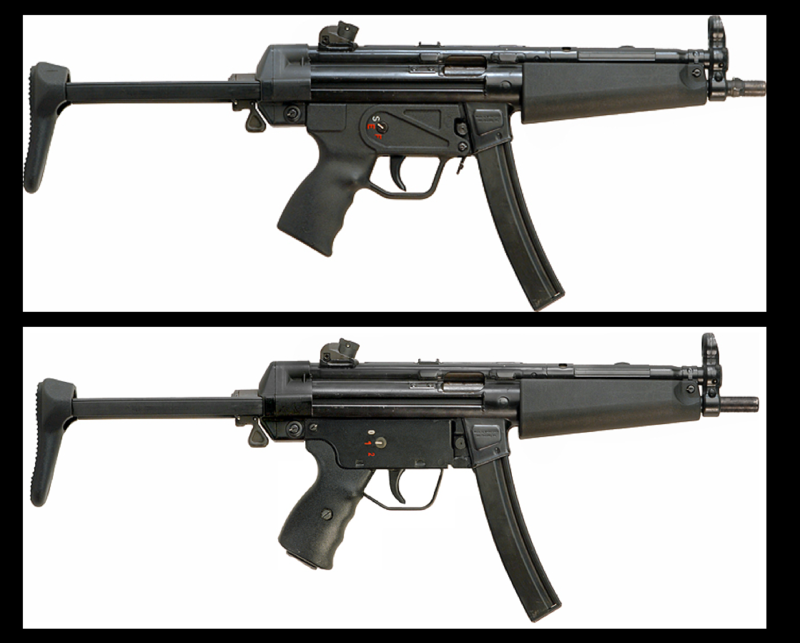 Bottom: A Heckler & Koch HK94A3 carbine converted to resemble an MP5A3. Okay, what did I just say? 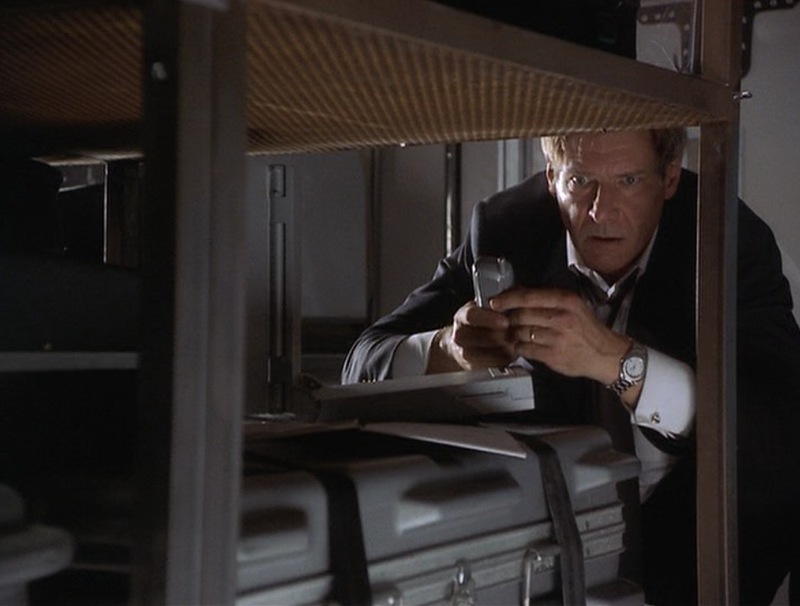 In the movie biz – particularly the action movie biz – reliable and plentiful weaponry is often needed. In some films, as I’ve mentioned, 9 mm Star Model B pistols were used as identical stand-ins for the more popular but less blank-fire-reliable M1911. With some submachine guns, reliability isn’t so much an issue as legality. The MP5A3 is an incredibly popular submachine gun that you’ve seen in countless movies. However, the automatic capabilities make legal use limited. 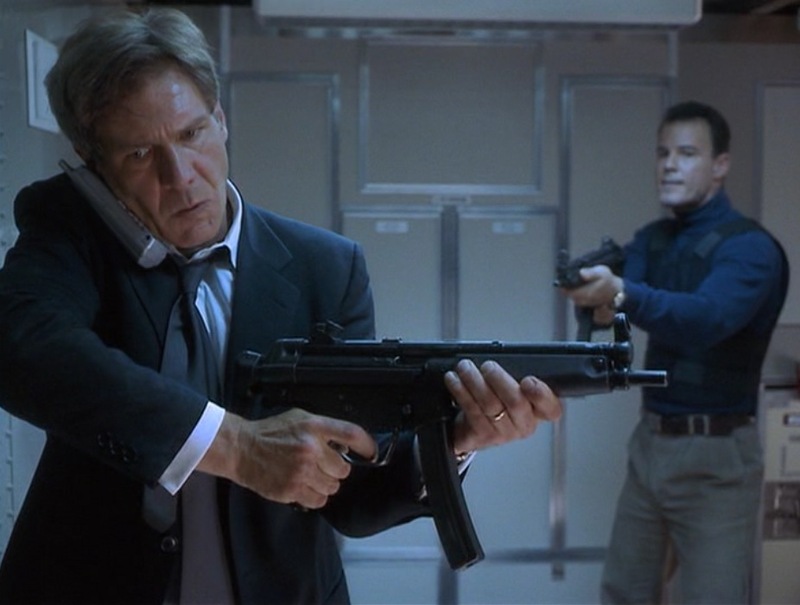 To account for this, movie prop houses such as Stembridge Gun Rentals – the supplier of this particular film – converted the very similar looking HK94A3 carbine to resemble the MP5A3 by engraving a “2” position for full-auto near the all-metal 0-1 trigger group of the HK94. Further inspection of the SMGs seen in the film reveal barrels missing attachment lugs. The MP5A3 is a closed bolt submachine gun operating on roller-delayed blowback. It fires 9×19 mm Parabellum ammunition out of 15 or 30 round magazines at a rate of 800 rounds per minute. Length ranges from 21.7 to 27.6 inches depending on the length of the stock. Barrel length is 8.9 inches. Weight is 6.8 pounds. 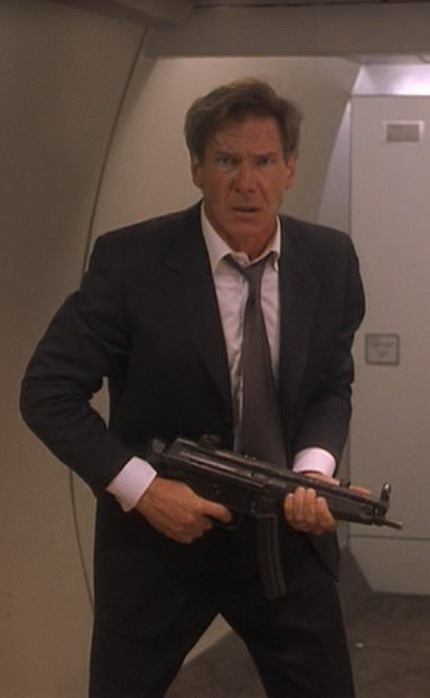 The HK94 is merely the American import version that fires at a single-fire rate only and has a 16 inch barrel. So, to put it short, Harrison Ford uses one of these. Unfortunately, so does the guy behind him. I always forget William H. Macy is in this. He gets quite a few badass moments as well, especially given the fact that he’s William H. Macy. Do we ever find out what happens to his baseball glove?